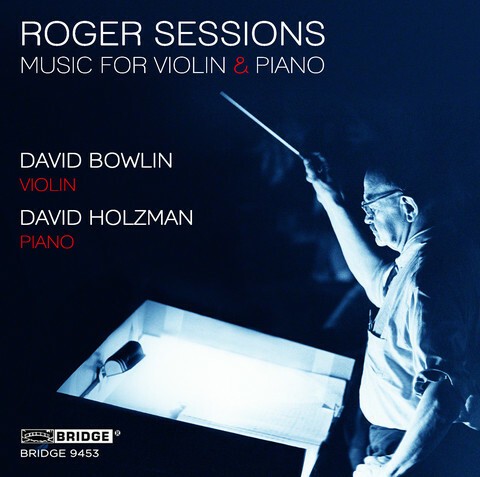 "Violinist David Bowlin and pianist David Holzman emphasize the intense emotional expressions of the music, which are easily overlooked in theoretical discussions, and their passionate and moody playing shows how Sessions' works can be quite affecting, despite their reputation for difficulty. While this album is of immediate interest to students of his work, adventurous listeners should try out Second Sonata for the bracing performance, and Sonata for Violin for a concentrated display of Sessions' lyricism and motivic invention." "Roger Sessions was probably more influential as a pedagogue than a composer, but the robust and astringent pleasures of his music shouldn’t be overlooked. Those are bountifully evident in this collection of chamber works for piano (Adagio, Waltz for Brenda, Second Sonata), for violin (Sonata for Violin) and for the two instruments together (a one-movement duet). Here we see Sessions moving from a complicated and ambivalent tonality — note in particular the gentle but knotty Waltz for Brenda — into the full-fledged duodecaphony of his notoriously difficult Sonata for Violin. Bowlin and Holzman are both masterful advocates for this music, and are beautifully recorded. " "Postludes is the longest work and is for solo piano. It's also the oldest and rather uncompromising. Here again contrasts seem to be all a part of the structure. For example the first two lead into a wild Toccata. The still, central point of the cycle comes with the Lacrimosa (number seven) but that is immediately followed by a frenzied Preambulum. This sets off another sequence mirrored by an almost impressionist Romance, immediately followed by a wild and angry Manége. Emotions now drained, the ensuing Epilogue seems aimless and the longest Postlude ends the cycle with a Feldman-like Requiem, but to what or whom? This is a fine and moving work and, it seems, a significant one for the composer. David Holzman is quite brilliant and captures the differing moods with panache." "The pianist David Holzman conquers the composer's moody, fitful, and dazzling 13 Preludes for Piano. And his performances of Twinkle Bells makes this short etude seem a dream-come-true encore piece for a piano recital." "Both comparisons for the 'Passacaglia' come as part of contrasting recitals that more fully survey the totality of Wolpe's piano output. While [one performer's] virtuosity and [another's] eloquence are fully at the service of this music, neither evinces quite the insight and panache of Holzman or is recorded with such visceral immediacy. Nor could the booklet, interleaving the pianist's own commentaries with biographical insights from Wolpe authority Austin Clarkson, be bettered in terms of 'setting the scene'. Combative and demanding yet also communicative and inviting, this music, and this disc, deserves the widest dissemination." "Passacaglia is a masterly construction of tempestuous drama and brooding introspection. Mr. Holzman's ability to bring clarity to the dense counterpoint and thick textures is remarkable. An entirely different interpretation from Peter Serkin's excellent 1986 recording on the New World label, Holzman brings an earthiness to this important work." This excellent series of music by Stefan Wolpe, whose life spanned the first three quarters of the last century, continues both to perplex and to delight. To perplex because the musical character of German exile to Palestine Wolpe was so complex, enigmatic and diverse. To delight because of the very high quality both of that intriguing music and its playing. Indeed, David Holzman's first CD in the series (BRIDGE 9116) in 2003 was nominated for 'Best Solo Instrumental Performance' in that year's Grammys and did in fact go on to win AFIM's INDIE award as 'Best Classical CD'. The current recital has all the vigour, perception and delicacy of his earlier success. The music played here was written between 1926 - before Wolpe and Irma Schoenberg (1902-1984) emigrated to Palestine, in 1934 - and 1959 only just over a decade before his death. Particularly noteworthy is the first complete recording of Wolpe's huge Four Studies on Basic Rows (1935-36). It occupies almost half this CD and includes the composer's most frequently-recorded piano piece, the 'Passacaglia' [tr.4], which is in turn the longest single movement here at getting on for a quarter of an hour. Music representing Wolpe's time in Germany, Palestine and America is included. It varies in complexity and scope from the experimental to music written for his students. So you're getting a mixture, a taster, of Wolpe's output for the instrument. You're also getting it played by undeniably the greatest interpreter of Wolpe's keyboard music alive today. 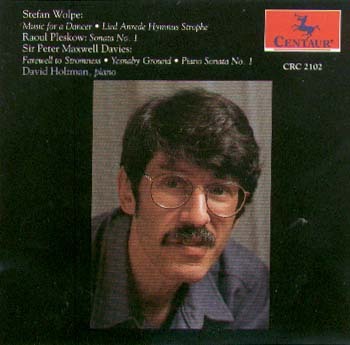 In his essay for the CD's liner notes, Holzman describes how he has come to know Wolpe so intimately that he can detect the composer's most minutely expressed moods and feelings in his music. Although this is evident from Holzman's control of tempi, phrasing and timbral nuance, the pianist is never permissive to the exclusion of the true musical essence which he's gently intent on conveying. It's insight and interpretation first, and any hint of special understanding second. The playing of the 'Passacaglia', for instance, is approached with great confidence and all the necessary familiarity; Holzman unshowily brings to the performance his ability to anticipate and to pace the music yet is as fresh and full of surprises as can be. Holzman reveals and commends the depth and breadth as well as the engaging beauty of these works: Wolpe's fascination with the colours (literally) of intervals was never mechanical, forced or self-indulgently indecisive. Holzman quietly and effectively communicates with great conviction and confidence the gentle and at times understated loveliness in music whose titles sound as though they were mere exercises. They're not. Their range and originality are impossible to miss thanks to Holzman's perception and dedication. His playing is alert and alive. It continually presents new delights. Listen to the juxtaposition of the 'Pastorale' then 'Con fuoco' of the Two Pieces for Piano from 1941 [trs. 9, 10]. It's not that they could be by different composers (Berg then Webern perhaps); nor that the same composer is as versatile as he clearly is. The playing succeeds because it's conversant with the wealth of resources on which Wolpe draws at any one time. These include moods, light, invention, ties to other formats, references and original topoi in which Wolpe is so evidently at home. As a result, what does emerge in contrasts and parallels somehow has its own logic. Technically Holzman is flawless. The piano is recorded nicely forward yet with enough space to allow full air to the many timbres and palettes it's required to evoke. The notes, which are nicely informative - especially for someone new to Wolpe's world - explain the somewhat relaxed circumstances under which this recital was prepared and executed. Indeed, there's a spontaneity and lack of deliberateness to the playing, to the order in which the pieces are heard and consequently to the listener's overall delight in this slice of a very intriguing composer. But this is a freedom which not for a minute even hints at sacrificing the rigour necessary for music as demanding as this. The result: an hour and a quarter's sheer enjoyment and inspiration. This sixth volume in Bridge's series fulfils the promise of the others released so far. It's a great introduction to Wolpe's piano music for those unfamiliar with it. Since most of the pieces here presented are not available elsewhere, Holzman's recital will also satisfy collectors of Wolpe. Don't hesitate. The juxtaposition of piano music by two such different composers as Sessions and Shapey is interesting. 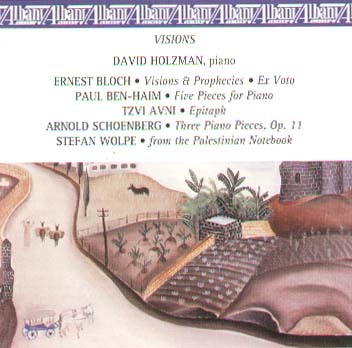 It works well on this useful CD thanks to the dynamism and perception of pianist David Holzman. It's to be welcomed for another reason: it helps to redress the balance after a period of neglect following their deaths in 1985 and 2002 respectively. It could be argued that the reputation of each was poorly established even before then and has been further obscured (by neglect) ever since. Sessions music is nowhere near so 'difficult' as such a reputation would suggest. His first Sonata, for example, is lyrical, bouncy almost, sunny and immediate. Holzman plays its single movement - it lasts almost a quarter of an hour - with measured attack, never lingering nor yet rushing. He persuades us that there is much to be squeezed from its at times busy sounding full and rich passages. Holzman invites us to glance back to Ives … and even to Brahms! … through the eyes, perhaps, of Carter. Like Messiaen's, the voice of the third sonata (from 35 years later and fully serial) is rich, packed and dense. Yet Holzman draws out Sessions' assuredness. The composer was not one to muse aloud or foist his experiments on us as he went along. This music is as carefully pre-considered as anything by Webern or Bartók. Its compelling beauty is spare in the first movement; yet we are teased, almost, by the changes in pace and texture. As it goes on the sonata becomes wilder and more expansive. Yet it never loses a classical beauty of melodic line for all the furious counterpoint and 12-tone attack. Holzman stays in perfect control without a hint of woodenness. He is an ideal pianist for this repertoire: he has not only an amazing technique (and at least 20 fingers); but his sensitivity to the inner structure of the music is sure and revealing without being overly 'pianistic' as such. Ralph Shapey came from a different world, in some ways. Proletarian to Sessions gentry, he was most at home in the Abstract Expressionism of the New York scene. Shapey studied with Stefan Wolpe but was as close to Feldman (and even Cage) in his interest in fragmentation, pulsing extracts of sound surrounded by silence as a valid way to move a work forward. Holzman is - again - completely in accord with this idiom. Mutations, Mutations II and 21 Variations have in common an interest in tension and withheld resolution. There is even more of Webern in the condensed nature of pieces like Mutations [tr.5]. It dictates its own terms of reference and rules. In that sense it needs to be played almost as an introverted and highly refined and concentrated interlude. And so Holzman plays it - yet somehow as an inevitable complement - to the rest of one's day - whose purpose and context can neither be ignored nor forgotten. Life oozes out of it. Similarly Mutations II is even sterner. It's hard to tell - even after repeated listenings - whether Shapey has any peace in mind. Or whether - perhaps like Shostakovich - he really does despair and simply wants to portray incoherence without limit. Not that the music lacks direction. Again, that's a strength of Holzman's. It moves towards and away from centres of gravity tonally. Yet Mutations II does seem to be coming apart in all other respects. Nowhere is Holzman's identification with the way Shapey was thinking when he conceived these pieces clearer, nor is Holzman's expert grasp of the music more stunningly visible, than towards the end of Mutations [tr.6] - and, for that matter, throughout the whirlwind Mutations II [tr.7]; those four hands again! Amazing. 21 Variations is much more figurative, chromatic, somewhat less abstract - at least in conception. The clusters, chords and clamour are as prominent as ever. Yet they are less the vehicles for the variations' development; more the result. Once again, Holzman is completely in tune with such an underlying purpose; he pulls out every nuance and subtlety without losing sight of Shapey's intention. In other words this is a performance where flourish, virtuosity (however tempting and even inevitable it could have been) is rejected for insight, patience and authority. Authority of a curious, not a demonstrative, kind. Both Sessions and Shapey had few misgivings about distilling their reactions towards their century (and its art, its music) into abstract and almost romantically nostalgic styles. That, perhaps, is what they have most in common. Not that Holzman is out to build his performances entirely - or even chiefly - on commonalities. But what each composer's approach says about the other's is always illuminating from the hands of someone who is so at home in, and positive about, both. This makes this a special CD with few others exposing Shapey's music in particular to the same extent. It will not disappoint. The presentation of this CD with an informative essay by Holzman and a reference to his lecture on Shapey is good; it's businesslike and a little severe - but a great background to two composers who surely deserve reassessment. Outstanding playing like Holzman's here is more than a giant leap towards that. His total understanding of the music, its context and its strengths commend it to us not for its perceived difficulty or lamentable obscurity, but its beauty and power. "Though this is the last thing I have to say about this release, it should have been the first. Pianist David Holzman (who also wrote the astonishing notes in the booklet) is an extraordinarily accomplished performer. That he knows these works intimately goes without saying. His feeling for this music is evident. He manages not to approach it mechanically or in a cold, academic manner. He is the one responsible for making this music so immediate and clear (I would say he gives this music soul). I recommend this for those of you following advanced serial (and non-serial) techniques in 20th Century piano. It left me breathless." "David Holzman surely stands among the greatest living exponents of 20th-century American music. 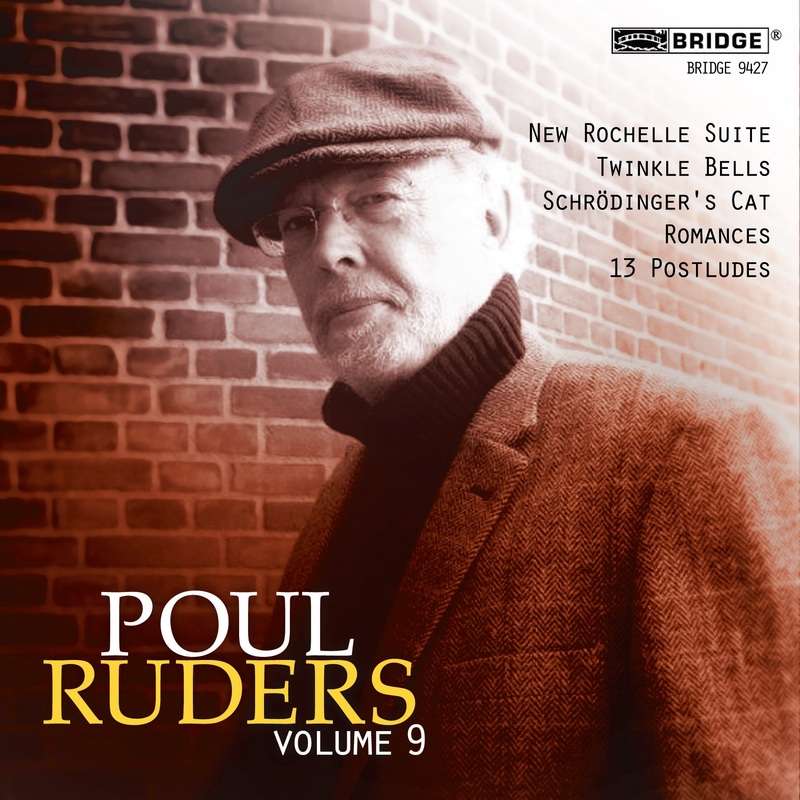 The 58 year old New York pianist's last CD (Music of Wolpe, BRIDGE 9116) was Grammy nominated, won the 2003 Indie Award for 'Best Classical CD of the Year', and won a Deems Taylor award. This new disc continues along that same intensely virtuosic path, with heroic readings of seminal works of Roger Sessions (1896- 1985) and Ralph Shapey (1921-2002). These performances simply must be heard to be believed! What distinguishes Holzman's superb pianism from so many others is his uncommonly deep musical vision which lends poetry and unity to even the most complex and sprawling structures. Here are pianism and musicianship of the very highest order." "Let it be said that Sessions (or Shapey) simply couldn't have a better advocate and interpreter than David Holzman. This disc is one that elicits the 'Wow' response. The pianist has unerringly steely technique, but he has an intellect that allows him to grasp confidently the conception and structural line of this music. He clarifies everything. There are passages where the dense contrapuntal textures are so well differentiated, one might assume this was four-hand music (as an example, the fiery, overflowing explosion of Mutations II has to be heard to be believed. If there is any drawback, it is that one will not get the most tender or liquid touch from Holzman (though this does not mean the man can't produce a pianissimo). The playing is, as I said, 'steely'. But it's a small price to pay for the passion, control and rigor that I think admirably matches the spirit of both composers' music. On top of it, the pianist writes suitably challenging, intellectually chewy notes. And Bridge's sonics are bracingly big and clear. While a little out of left field, this could be a Want List item for me come year's end." " For those who dare to venture into the rarefied world of Stefan Wolpe, they could hardly do better than with this exceptional Bridge release. " "The same intrepid label has just given us another Great Day by issuing David Holzman's searing account of another legend, Wolpe's Battle Piece. Elliott Carter called Battle Piece 'amazing.' It's at least that and so is Holzman's mighty performance. This is an experience you owe yourself. You'll never forget it." "Mr. Holzman's recital on Composers' Recordings is one of the great piano discs of the decade..."
"Holzman is an amazing pianist to listen to, engaging a technique of blazing accuracy in the service of beautifully expressive playing. The scores are filled with poetic descriptions of the musical intent behind the exacting notation and Holzman manages to give equal weight to the exactitude and to the poetry ...every detail is employed in the service of communicating meaning on the part of both the composer and the performer. One special joy is the wonderfully expressive variety of uses out to the grace note decorations. Both compact discs include six pages of helpful booklet notes. Holzman's are particularly lucid." 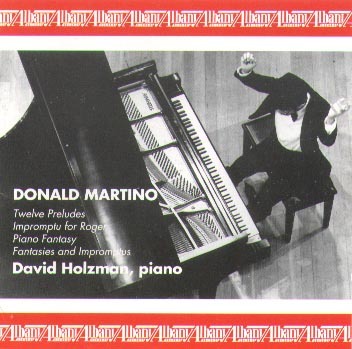 ",,,anyone listening to Mr. Holzman's performance of Mr. Martino's compositions on these Albany CDs will surely admire his sterling qualities of touch, timing and tone." "The performances are wonderful throughout." "[The music] certainly makes punishing demands on the player, and David Holzman acquits himself with brilliance, He simply burns the keyboard up, producing vivid, often thunderous sonorities vividly captured by Centaur's realistic sound. These fierce, demanding works are well worth hearing, especially with such a splendid performance and recording." "This fascinating recording presents piano music by Jewish composers of three generations. In his brilliant performances, David Holzman illuminates the many-sidedness and distinctiveness of the styles heard here. The high artistic level of the material reaches from Wolpe's Jewish folk miniatures which, in their aphoristic brevity serve a much higher purpose than that of mere encores, to the epochal abstraction of Schoenberg's op.11. I have rarely heard these works so clearly illuminated and differentiated as here."